Greetings friends and happy Friday! 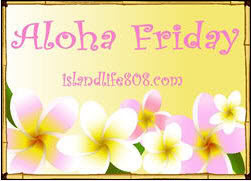 My Aloha Friday question of the week is: Do you correspond with anyone via snail mail? Do you send post cards, letters, etc? Or, are all your interactions online? Everything is pretty much online unless someone doesn't have an email account. They I'll send an actual greeting card. Where Did the Last 7 Months Go?